A generous gift from the family of the late Edwin L. Carstensen, renowned scientist and founder of the Rochester Center for Biomedical Ultrasound (RCBU), will enable the Center to invite a leading expert from the field to the University of Rochester campus each year to present a seminar, interact with faculty, and deliver a distinguished Carstensen lecture. Dr. Carstensen was the Arthur Gould Yates Professor Emeritus of Engineering and Senior Scientist in Electrical and Computer Engineering at the University of Rochester. His illustrious career, spanning nearly 50 years, was celebrated during a special session at the annual conference of the Acoustical Society of America in June. Students and colleagues celebrated his life and work in acoustics, especially as applied to biomedical acoustics, physical acoustics, and selected problems in underwater sound. The Edwin and Pam Carstensen Family Fund was announced during the special session, to advance the RCBU’s goal to provide a unique, collaborative environment for engineering, medical and applied science professionals in the Rochester area to investigate the use of high frequency sound waves in medical diagnoses and therapy. “Ed Carstensen was a pioneer in the field of ultrasound and the development of biomedical engineering as a field,” Professor Dalecki said. “He was a wonderful mentor to many students, and was a valued colleague, not only at Rochester but also across the world. This fund will help ensure that his legacy endures,” she said. Contributions to the Edwin and Pam Carstensen Family Fund can be made by contacting Eric Brandt at (585) 273-5901 or eric.brandt@rochester.edu. 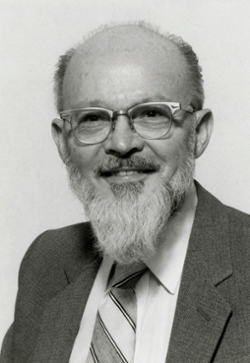 Dr. Carstensen’s contributions to understanding the biological effects of ultrasound and extremely low frequency electric fields won him widespread scholarly acclaim. He received multiple awards from organizations such as the Acoustical Society of America, the American Institute of Ultrasound in Medicine, and the IEEE, of which he was a life fellow. In 1987, he was elected to the National Academy of Engineering. Working with a committee established by the National Institutes of Health, he helped set the worldwide standards for ultrasound exposure. His landmark book, Biological Effects of Transmission Line Fields (1987), was widely influential in legal and government actions related to exposures to electromagnetic fields. After joining the University of Rochester in 1961, he quickly became director of the nascent biomedical engineering program. In 1986, he founded the Rochester Center for Biomedical Ultrasound, one of the largest groups of MD and PhD researchers active in medical ultrasound. The Center has since grown to nearly 100 members, with several visiting scientists from locations around the country. Its laboratories are advancing the use of ultrasound in diagnosis and are discovering new therapeutic applications of ultrasound in medicine and biology. The Center’s research spans a wide range of topics in diagnostic and therapeutic ultrasound including sonoelastography, ultrasound contrast agents, 3D and 4D ultrasound imaging, tissue characterization techniques, lithotripsy, acoustic radiation force imaging, novel therapeutic applications, multi-modal imaging, nonlinear acoustics, and acoustic cavitation.